Posted on July 16, 2014 at 8:23 pm. East Village residents gather around treats and talk neighborhood shop. 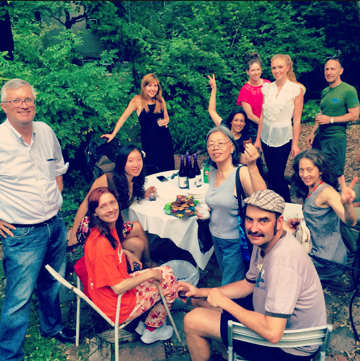 Last Tuesday, July 8th marked the East Village Community Coalition Host Committee’s third ever “First Tuesdays” event. We were fortunate to make use of the beautiful Green Oasis Community Garden & Gilbert’s Sculpture Garden. This large-lot community garden, tucked away on 8th St. near Avenue D, was slated to be shut down by the Giuliani administration. The gardeners successfully protected the site through the early aughts. Thanks to their efforts, the garden today features a gazebo, stage, brick oven grill and a koi pond. Green Oasis was the perfect setting for East Village residents and enthusiasts to socialize, share with and support one another. 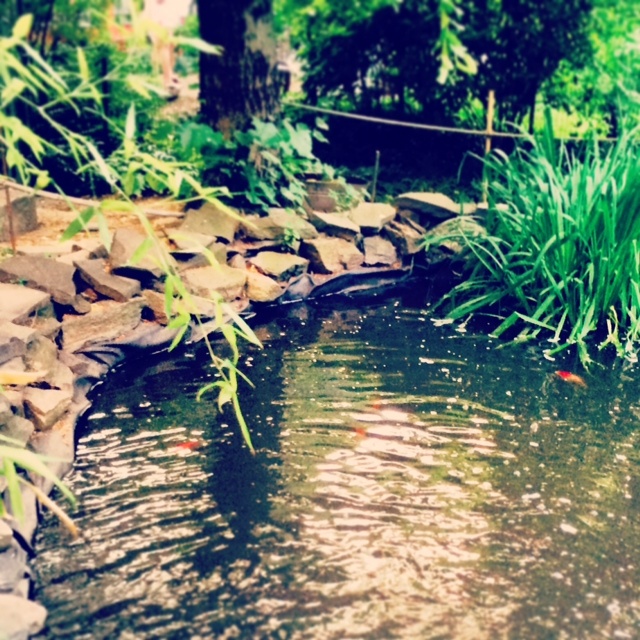 The Koi Pond, one of the many beautiful and unique features of the garden. Throughout the evening, residents mingled over wine and delicious cookies generously donated by Taneesha Crawford of Rebellious Treats. We were fortunate to welcome State Assemblymember Brian Kavanagh who joined in the festivities. Each guest left with a printed map marking East Village community gardens and their accompanying information. Interested in finding your local community garden? Click here or check out this East Village Gardens Key. If you weren’t able to attend our most recent First Tuesday, don’t fret! We are in the midst of assembling another exciting event for Wednesday, August 13th, and you’re invited. Looking to learn more about our Host Committee and the EVCC, or considering volunteering? Contact HOSTCOMMITTEE@EVCCNYC.ORG for more information.